Various. Includes dry and mesic prairies, pastures, thickets, sandy oak savanna. Southern Canada and most of the U.S. except CA and FL. 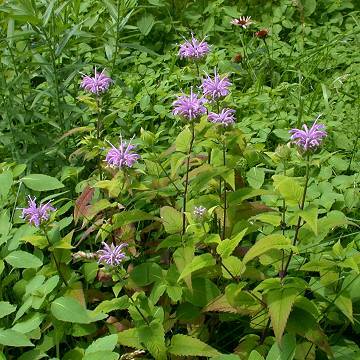 Aromatic, perennial herb. Leaves opposite, petiolate, acuminate, more or less serrate. Flowers in solitary, terminal clusters; corolla lavender, the upper lip nearly straight, softly pubescent and densely villous at the apex; stamens surpassing the upper lip. An attractive species that is easy to grow in full sun and is drought tolerant.